Once admitted, you will receive a letter signed by Colin Russell, University Registrar, containing your personal WebAdvisor username and password. This information is required to access your University of Winnipeg email, printing, and Student Planning accounts. Please contact Dagmawit Habtemariam, Graduate Studies Enrolment and Budget Officer, at 204-786-9309 if you have not yet received this letter or require another copy. You may view your course sections by visiting WebAdvisor. Please note you cannot register via WebAdvisor. If you already have a username and password, you may log in. If you do not yet have a username and password, log in as "Guest". If you have questions about the sections you are viewing, please direct them to the specific department in question. A meeting with your advisor(s) or supervisor(s) prior to registration is required by most graduate programs. If you are unable to meet with your program advisor in person prior to registration to discuss your course options, please consult with them via phone or email regarding your course selections well in advance of the registration deadline. Graduate Students must now register for their courses online*. To access Student Planning, log in to WebAdvisor and then select Student Planning under the Registration menu. Visit the Student Planning webpage for instructions and video tutorials. To view course offerings and course descriptions, consult WebAdvisor. Once you have submitted your registration online, your supervisor and program chair/coordinator will review and approve the registration. *Students in their qualifying year, occasional students, and students attending under the Western Deans' Agreement or a Letter of Permission must register via the paper registration form. Special Study/Project: courses must first be approved by the department and created in WebAdvisor. Be sure to enquire about and plan these courses well in advance. 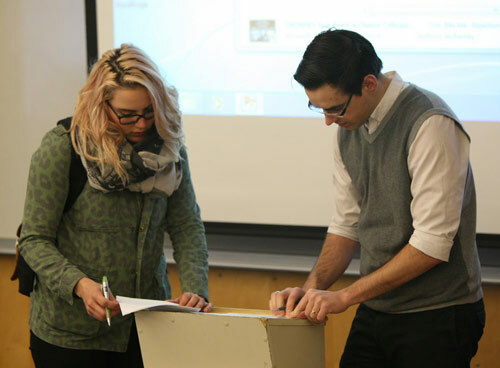 Joint Masters Programs: The registration form for the Faculty of Graduate Studies of The University of Manitoba is used for all Joint Masters Programs. The form must be completed and signed by the Chair of the Joint Discipline Committee and returned by mail or in person to the Faculty of Graduate Studies at UManitoba. It is strongly recommended that you do not wait until the final day to register. Allow sufficient time to ensure you are registered properly in your course(s) of choice and for your advisor and program chair/coordinator to approve your registration. Late fees will be applied to late registration. If after reviewing the information and videos on the Student Planning webpage you have questions or problems registering online, please contact Eric Benson, Coordinator, Student Records (Graduate Studies) at 204-786-9466 or Dagmawit Habtemariam, Graduate Studies Enrolment and Budget Officer, at 204-786-9309. If additional time is required upon completion of your allotted time to complete your degree, you may apply for a TWT (if Thesis Based Program). The Thesis Writing Form must be completed and submitted accordingly by dates on the form. There are no fees applied to your account during this TWT and it's not part of your “Continuance Term(s)”. If you require additional time to complete your degree beyond the “Thesis Writing Term” (if applicable), a Continuance Term is available and is in addition to your previous academic year(s). If you are requesting a Continuance Term, the Continuance Form must be completed, submitted, and paid accordingly by dates on the form or late fees will be applied. See the form for more information about CT.
Once the registration is submitted, it is each student's responsibility to view WebAdvisor for applicable fees owed and to pay the fees by the deadlines indicated. You must meet with your program advisor or supervisor to discuss your course changes. Your registration form must be signed accordingly prior to submission of your registration form - without the supervisor signature(s), your registration will not be processed and will be returned to the department. Registration forms are available on the forms page. Please submit your completed registration form to Student Central (1st Floor Rice Building), 489 Portage Ave, Winnipeg, MB, R3B 2E9 after which they will be processed in sequential order. If you have questions about your registration, please contact Eric Benson, Coordinator, Student Records (Graduate Studies) at 204-786-9466. Registrations processed after the course change period will incur applicable late registration fees. Registration in Spring/Summer courses begins March 1st of each year and must be completed by the first day of course commencement. Late registration fees will be applied to registration completed after the first day or course commencement. See below for Directed Study/Project and 1, 2, and 3 week Intensive course registration dates. Registration in Directed Study/Project courses in all Grad Study Programs in any term must be completed by the first day of course commencement or late registration fees will be applied. Registration in 1, 2 or 3 week intensive courses in all Grad Study Programs in any term must be completed three (3) weeks prior to course commencement or late registration fees (will be applied. Registration in Certificate in Theology courses must be completed by the first day of course commencement or late registration fees will be applied (unless a 1, 2, or 3 week intensive - then said rules apply). For courses that do not fall into one of the categories listed above, please contact Eric Benson, Coordinator, Student Records; Graduate Studies at 204-786-9466, Office 1RI26. All Graduate Students must complete a Withdrawal/Course Change Form, have it approved accordingly, then submit to Student Central. All other course that do not follow the above (ie: Directed Study/Project, SPE, Spring/Summer Term) – contact Eric Benson, Coordinator, Student Records; Graduate Studies at 204-786-9466, Office1RI26. You will require a University of Winnipeg Student ID card in order to access the Library, purchase bus passes at a student rate as well as other access. You may pick up this card from Student Central, 1st floor, Rice Building, 489 Portage Avenue. You may contact Student Central by phone 204-779-UWIN (8496), 1-800-956-1824, or by fax 204-783-4996. The Government of Canada requires students who are neither citizens nor permanent residents to obtain a Study Permit to study in Canada. Effective immediately, The University of Winnipeg requires an up-to-date record of your Study Permit to ensure your eligibility to study in Canada at The University of Winnipeg. All registered international students at The University of Winnipeg must present their original Study Permit to Eric Benson, Coordinator, Student Records (Graduate Studies) 204-786-9466, Office 1RI26. Current records of this information is required to ensure your eligibility to study in Canada at the University of Winnipeg. Registrations may not be processed until this document has been submitted. It is important to renew your Study Permit well before it expires to ensure your continued eligibility. Any renewed Study Permit must be presented to Eric Benson in order to update the student record. The University of Winnipeg Student Association (UWSA) Health Plan is available upon request for Domestic students (International students are automatically enrolled when registration is complete). There is both single and family coverage available. If you wish to opt-in, you must complete a UWSA Health Plan application form available from the UWSA office. All students can extend their UWSA health coverage to their spouse and/or dependents. For more information about the UWSA Health Plan, please contact Tiffani Sawatzky at sustainability@theuwsa.ca or by phone 204-786-9992.